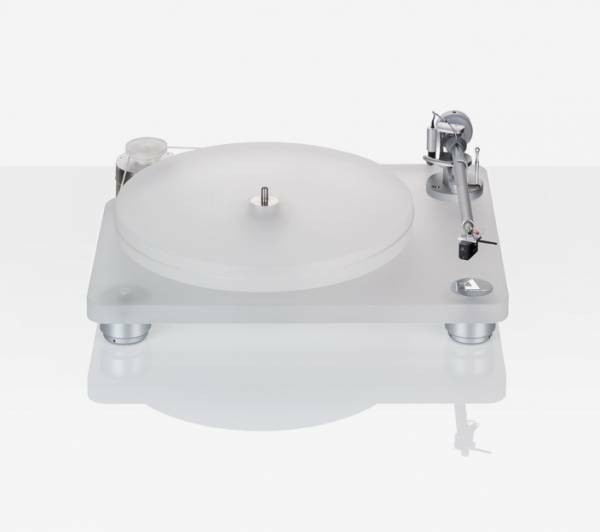 This technically improved version of the well-known Emotion turntable is based on a semi-transparent chassis designed to reject harmful resonance. A 30mm-thick acrylic platter is belt-driven by a decoupled synchronous motor. The patented ceramic magnetic bearing (CMB) provides superb speed stability. A resonance-optimised physically separate die cast metal motor housing ensures that motor vibrations cannot harm the sound. This provides maximum speed stability and vibration-free replay of your favourite records from Abba to Zappa, from Beethoven to Schoenberg. Matched with the Satisfy carbon tonearm and a Clearaudio moving magnet (MM) cartridge, the Emotion SE succeeds in extracting even the most delicate information stored in the record groove. Even newcomers to the world of high-end audio can now enjoy maximum accuracy of music reproduction and a superior listening experience. Related links to "Clearaudio Emotion SE Transparent, inkl. Satisfy Kardan Carbon"
Customer evaluation for "Clearaudio Emotion SE Transparent, inkl. Satisfy Kardan Carbon"